Note: Diana’s week in the life is from this summer. Oldest is going to sleepaway camp today! We just got back from vacation last night, so today I am taking her to Target to obtain sufficient shirts and shorts (up to 14 from 9), plus some PJs, to be enough for camp, since she can’t do laundry while she is there. I get up with the kids around 7:30 (DH is a night owl and is almost never up early) and we head to Target around 9:30. Luckily it’s not terribly crowded. We stop by Costco at 11:00 to get seltzer and sunscreen, etc., and I drag them in and out in 30 minutes. We also pick up some pizza for lunch. Back at home, I help the oldest pack while DH plays with the other kids. When it is time for her to go at 3:00, our youngest is sleeping, so DH stays at home with the younger two while I take the oldest to camp. No tears, she just gets a little quiet. I get home around 5:00 and fix leftovers for dinner. Then I hop on a call for an alumni board that I am on while DH is playing video games with the kids. We put them to bed at 8:00–8:30 (it is so quiet with only two!) and DH and I watch a show before my bedtime at 10:00. The younger two kids are going to day camp today. I have set our nanny up with about 10,000 errands to do while they are at camp, and DH has some work tasks for her too. I head to the office around 9:00 (I try to avoid peak traffic and make my days in the office short, since we live far away) and work until about 3:00, then come home and finish up at 5:30. DH works from home but had a couple of meetings at lunch and after. I make Vietnamese ground pork, rice, and veggies for dinner and then we all go swimming before the kids go to bed. Then DH and I take out the trash and have alone time. Once a week my husband and I commute in together, which makes it much better! We can discuss the kids, our shared projects, etc. — a couple of times we have even had conference calls together during the commute! Otherwise, traveling off-peak is the best way to make the commute as short as possible. And I mean really off-peak: leaving the house at 5:45 and leaving the office at 2:00, for example, or going in at 10:00 and staying through dinner, then driving home afterwards. OR leaving the house at 9:30 and leaving the office at 2:00, so I am only in for a couple of hours. Up at 7:15 and have breakfast with kids. I have calls from 8:00–10:00 a.m. today, so nanny drops the kids off at camp while I am on calls. Then we go over additional stuff for her to do this week. I do some more work and then have lunch with DH from 12:30–1:30 or so. Work all afternoon, then I make the kids leftovers at 5:30 while DH goes to an off-site dinner meeting. After dinner, they play while I get caught up on more laundry from our vacation and put some things away that were still packed. I put them to bed at 8:30 and then read a book/watch TV until 10:00. Up at 7:30 and have breakfast with kids. I pack their stuff for camp and do dishes from 8:15–8:30 and then do all their sunscreen and yell at them to get their shoes so we can leave for camp at 8:50. Drop kids off at camp, then go to CVS to get some gum and nail polish and a prescription refill. I wake DH up at 9:30 and then do some work before our joint call at 10:15. After that call ends we do more work until noon, then grab some lunch and I throw in more laundry. We work all afternoon and then leave at 5:30 to go to a dinner with friends. Traffic is horrendous but we get there around 6:30. After dinner, we drive home and watch a show from 9:00–10:00 (nanny has late day and has put the kids to bed). DH’s out-of-town guests arrive after I go to bed. This is our second nanny; we found the first one on Craigslist and this one on Care.com. It was really hard in both cases to find someone willing to be paid on the books! Same morning routine with kids as Wednesday. Then at 9:00, DH rides with his friends to his office while I take our car to my office. I have several meetings and don’t leave the office until 5:00, and traffic is horrendous. I call DH and arrange to meet him and his guests (work/personal friends) at dinner, and get there around 6:30. After dinner, we go back to the house and have dessert with the guests (nanny put the kids to bed) before bedtime. Day off from work (I am at 80% time). I get up with the kids and get them off to camp like the other days. Then I go to the grocery store and get a few emails done. DH and his friends are on a day trip (work) so I have planned to squeeze in a massage at lunchtime. Bliss! I go back home and try to get all the laundry done and put away before going to the farmers market and picking up the kids at 4:00. I also do some more work email in the afternoon. I make a few veggie salads and hot dogs for dinner for the kids. (DH is not home yet.) We do some reading and TV time, then I throw them in the tub before their bedtime at 8:30. DH gets home and he eats dinner; we do our budget and watch TV before 10:00. My job was originally advertised as “part- or full-time”, so I negotiated the 80% going in. It is great — people don’t usually bother me on my day off and I have time to run errands and do a lot of household-management stuff that I wouldn’t otherwise get to do. Since I am at a mid-sized firm, my hourly requirement is lower than biglaw so I don’t usually have to make up hours on my day off. I try to sleep a little later but can only manage until 8:00. The kids are tired from being at camp all week, so they just want to watch TV all morning, and I let them so I can get all the laundry done (finally) and clear out the too-small stuff from the youngest’s drawers — a never-ending chore! After DH gets up, we have some lunch and then DH and our middle child play video games while the youngest takes a nap and I take care of dishes, paperwork, etc. After naptime we take them out to see Despicable Me 3 and then back home for breakfast for dinner (they don’t eat much, too full of popcorn!) and bedtime. Thanks so much to Diana for sharing a bit of her life as a working mom! 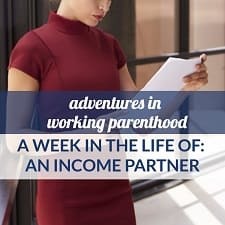 Readers, what’s your biggest takeaway from her week of work as an income partner, as well as her general work/life balance? Picture credit: Fotolia / Monkey Business. Super interested in these posts but it seems like Kat sort of mailed it in on the writing of this one…I want more information! Yes, seems like we usually get more from the italicized follow up questions – like how old are the kids? Also, nanny seemed to be working late frequently – is that part of the normal routine? Thanks to Diana Barry for sharing; LOVE this whole series! Now I’m curious about which suburb you live in :) What made you choose the huge house farther away vs. a smaller house possibly closer to the city? I’m always fascinated at people who do wild Boston-metro commutes (via car and not necessarily commuter rail). I’m newish to the area and I find it pretty wild. But I suppose everyone does it for bigger houses and better schools? Me too. Having lived in Boston, the people I knew who seemed to hate the area had really long commutes from far flung suburbs. And I can’t say that I blame them. But as Diana Barry does, it probably helps immensely to commute during off peak hours. I already feel that my 30 minute commute is too much, so this would never work for me. Fair enough! Sometimes I dream of having an actual kitchen-sized kitchen. But I will say the thing I really like about living in the city is being able to get to the children’s museum or science museums within minutes on weekends (and sometimes actually run there with the jogging stroller!) without it having to be an all-day expedition. Yeah, when we lived closer (it was 15-20 minutes on the weekend) that was nice, but now the kids want to stay there all day anyway so I don’t mind devoting half a Sunday to the trip in/out. Also curious what sorts of decisions you made to get to this point. 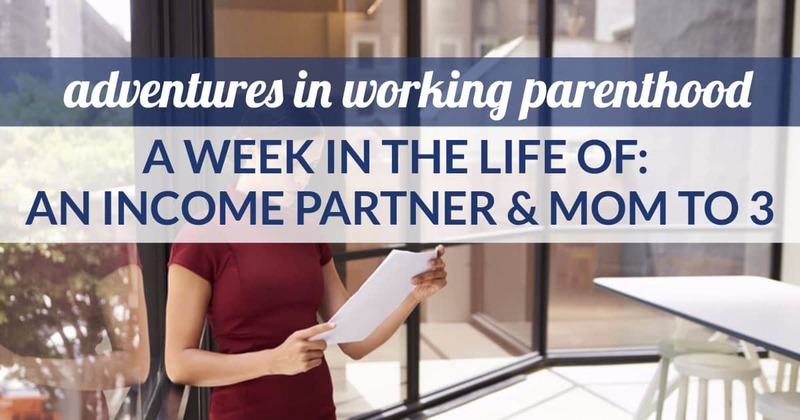 When to have kids, and how many; whose career took priority at what point; how long you’ve been at your firm and how that factored into them allowing you to WFH, etc. Can I ask you to ball park your income at the mid-sized firm? I’m really, really, really thinking of switching to a small firm as an income partner, and want to know if this is really feasible from a pay aspect. I make quite a bit of money, but am exhausted at my firm and don’t see how I could ever make equity here without essentially abandoning my children! Anon for this since it may out me, but in case another data point is helpful: I’m at a small firm in HCOL area, and income partners here tend to make around $250-350k depending on hours and business generation, while junior equity partners end up around $300-400k – in some years the junior equity partners make less than the income ones if an income partner kills it but the firm overall doesn’t do as well. Firm is primarily biglaw expats. Hours expectations are 1950 (most people end up at or slightly below that target) until equity partnership, at which point there is no written expectation but anecdotally it’s definitely a few hundred hours lower. Expectation is up or out, with income partnership being a stepping stone. Not biglaw $$$ but no one here is doing 2300 hour years. I recently spoke to a friend at a similar firm and while I’m sure it can vary significantly, their structure was similar – a little lower on both hours and comp, but not far off. Haha, my comp is REALLY low. Under 150. 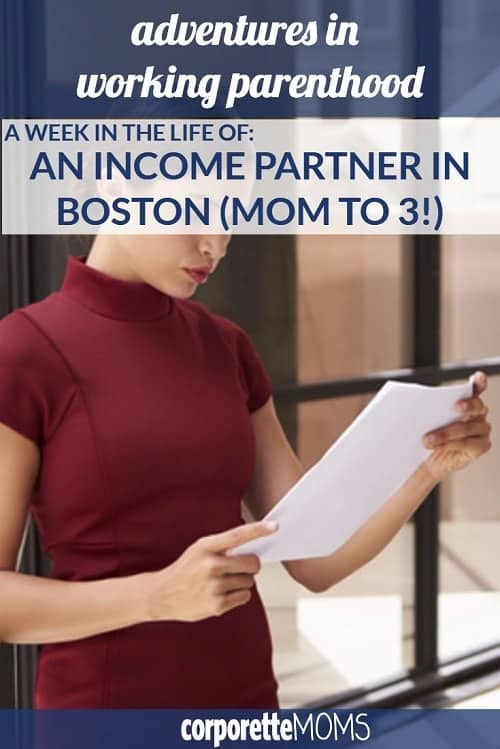 I have salary and then a very small percentage of originations, so it’s not a true “income” partner situation. This comment made me laugh. My husband and I both make this and feel incredibly wealthy. It’s all about perspective. We’re 32 in a southern LCOL midsized city. Love this series! thanks, anon! that would be a drastic cut for me (less than half what I make now), but it might be worth it. I had 2300 billables and far more nonbillables . . .
You seem to work from home a lot. did you have to negotiate that going in, or did you just slowly stop going into the office as much? I would LOVE to work from home more. What’s your usual schedule of in the office vs. home office? I only go in once or twice a week at this point. I used to go in 3x/week (out of 4 “working” days), and that was too much once we moved. I don’t know that anyone has noticed terribly much – my office isn’t big on facetime. Sorry, can’t thread comments on mobile! Our kids are now early/mid elementary. Yes, our nanny works late twice a week, and I often move her later in the morning if I don’t need to go into the office. We put her on salary so we just try to get the hours to be roughly equivalent every week. We wanted to have kids relatively early but it took a while, the first was born in my very late 20s. We didn’t really discuss whose career would be primary but I was fired while pregnant, so moved out of biglaw at that point. I made more the whole time I was in biglaw but since then DH has started to make more and now he makes about 2x what I do. Can you talk a little bit about what you did to bounce back when you were fired while pregnant? How far into your career were you? Did you work for yourself for a while? Got to another firm? Were you in the same practice area or different? If different, how did you sell yourself? Thanks! I got a settlement from the biglaw firm and then moved to a smaller firm. Same practice area. So I ended up having the ‘regular’ 6 month maternity leave that I would have had if I had stayed in biglaw. Diana, can I ask what your billable hour requirement is? Any clue what you billed during this week? Are you expected to generate your own clients/work or do you service other partners’ clients? I’m income partner at an Amlaw 200 and we are expected to do bus dev and bring in work. As a result, some days I bill 2 hours because of the time spent on bus dev stuff and admin (committees, mentoring, etc) even though I’m working all day. Does your firm allow people to stay as income partner indefinitely? I do both. I won’t make equity unless/until we hire more junior people so my originations go up (since I don’t really have bandwidth to do more unless I work 4 hours at home every night). Yes, there are a lot of non-equity people who have been at that level for years and years. Have you always/only used nannies or did you ever go the day care route? What made you switch and when? Only nannies. In Boston day care is super expensive so when we had #1, the nanny was only $75 more per week. I knew we wanted to have a few kids (I could have gone for 4) so I knew by the time we hit #2 the nanny would be cheaper. Another question! What does your social life look like? Are your friends mainly at work? In the neighborhood? Dispersed across the country anyway and you all talk by group text? I recently realized that one reason I’m terrified of moving out to the suburbs is a potential dearth of working-mom friends, or at least being farther away from our existing networks.